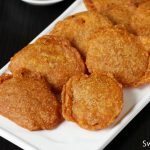 Aloo parkora recipe – Also known as aloo bajji. These are another tea time snack made using Potato mostly sold in tiffin centers and street stalls. Though not very popular, these are made in many homes especially during the monsoon to accompany their masala chai or coffee. 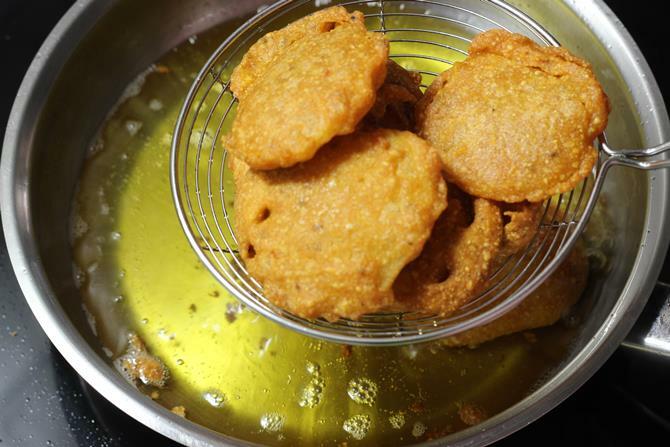 To make aloo pakora, sliced potatoes are dunked in chickpea batter and deep fried in hot oil. Pakora is a generic term used in North India for pakoda or bajji. Pakora are made using chickpea flour, carom seeds and any vegetable like onion, potato, mixed vegetables or with bread, eggs and chicken. 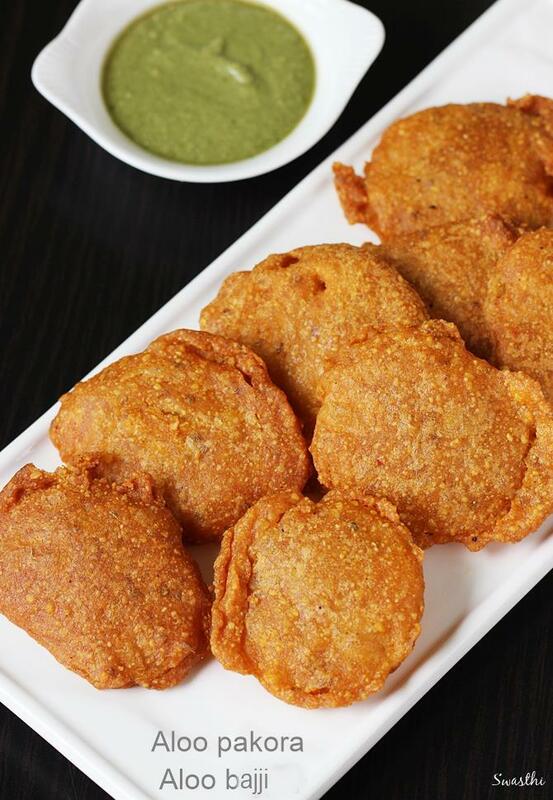 Deep fried snack made by dipping sliced potatoes in chickpea batter. 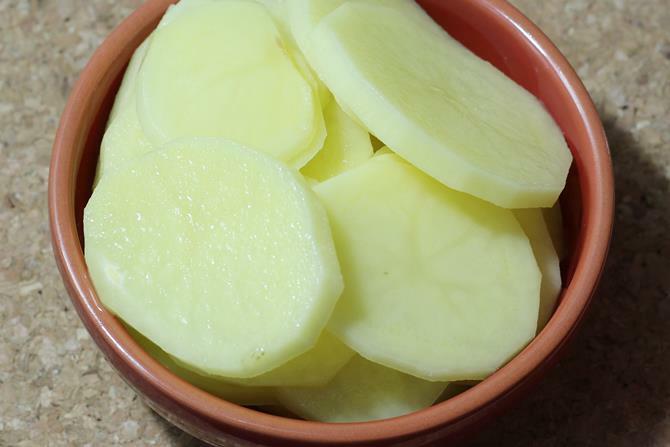 Wash aloo, peel and slice them to thin slices. Keep them in water until used. 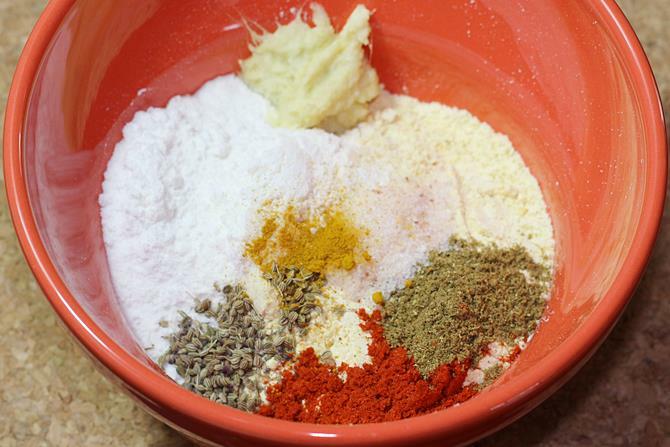 Make a batter using rest of the ingredients except oil. The batter must be of a medium consistency, neither too thick nor too thin. If unable to coat the potatoes well, sprinkle little water and slightly thin down the batter. Heat oil until hot enough. You can drop a small portion of this batter in oil and check if the oil is hot enough. The ball should raise well in the oil. 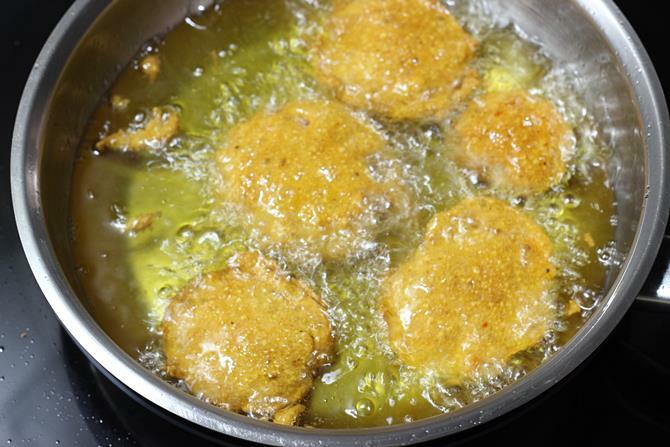 Dip each slice in the batter and deep fry them until golden. Drain aloo pakora on a kitchen tissue and serve hot. 1. Wash and peel potatoes. Slice them thinly otherwise they may not cook well. 2. Add them to water and set aside. 3. 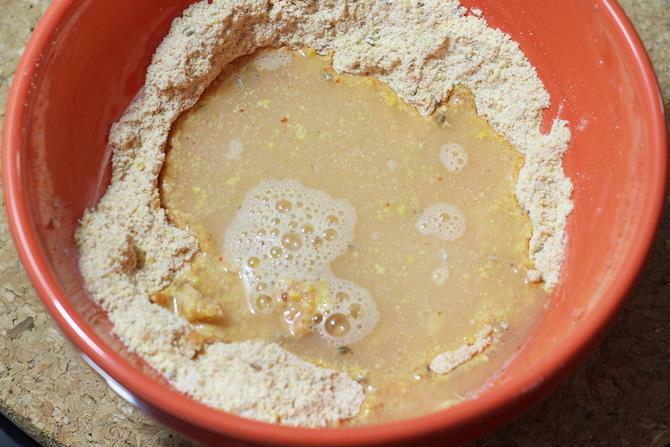 Add besan, rice flour, ajwain, red chili powder, salt, garam masala, ginger or ginger garlic paste and turmeric to a mixing bowl. 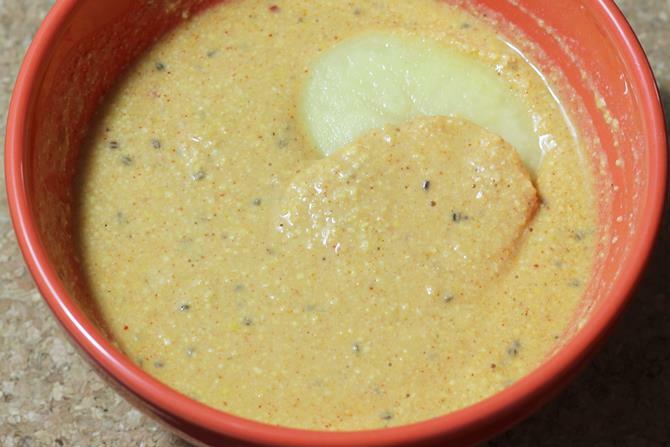 You can also make a fine paste of 1 small onion and green chili and add it to the mixture. 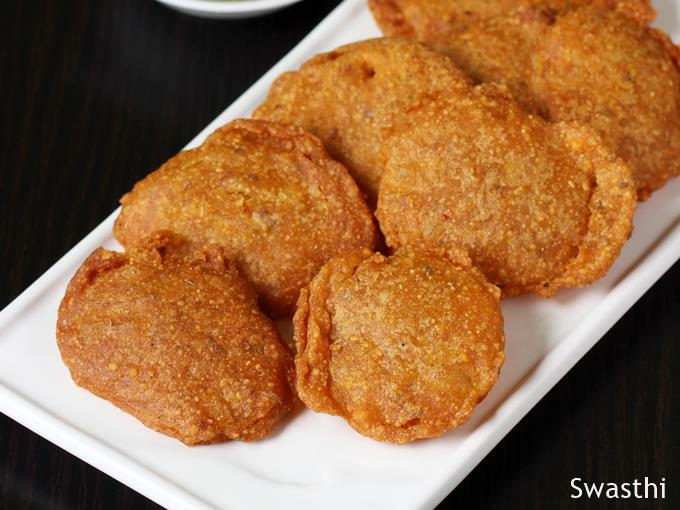 I have used coarse besan here which yields crunchy bajji. 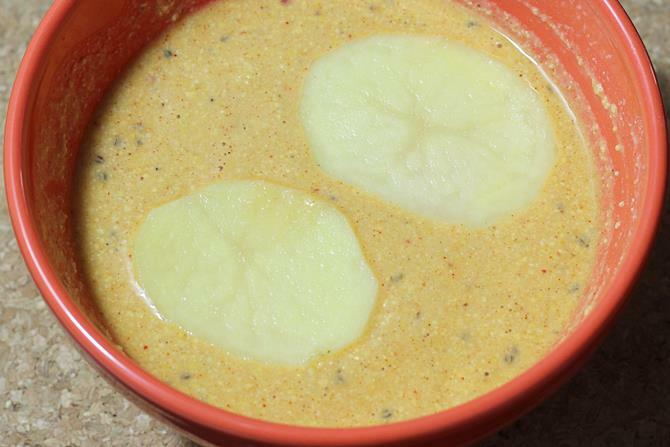 You can also add 1 tbsp of semolina for the crunch. You can substitute riceflour with corn flour. 4. Add enough water and make a batter that is not too thick or too thin. 5. If the batter is too thick it will not coat the potato slices. If it is too thin then the slices will not hold the batter. 6. Heat oil until hot enough. If it is very hot, aloo it will turn brown without cooking inside. If it is not hot enough they will soak up lot of oil. 7. Dip each slice in the batter and gently drop them in the hot oil. Keep stirring and fry until golden. They usually take about 3 to 4 mins to cook well and turn golden. However it may also depend on the thickness of the slices. 8. When golden fried, drain them to kitchen tissues. 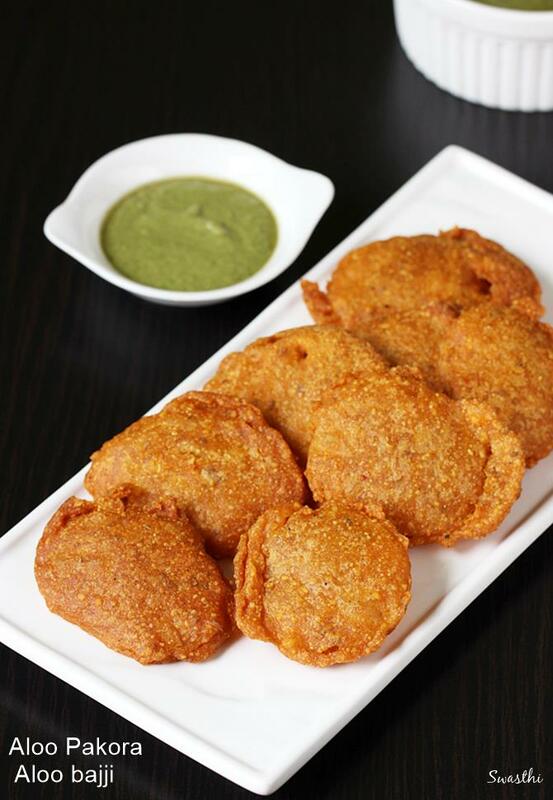 Serve aloo pakora with a cup of hot tea or with any chutney or sauce. Hi dear swasthi, I’m opening an indian fastfood in Iran. Do u have any idea for my menu? I read your comment on the other post as well. Please check this link on Non-veg recipes for the menu. Indo chinese chicken recipes are quite popular in most Indian food places. You may try starters like chilli chicken, chicken manchurian, chicken lollipop, chicken tandoori, chicken tikka etc. thanks swasthi, and i have one doubt, can i do aloo pakora without ajwain. is it fine. Yes you can do it, just add up some spices like crushed pepper. All recipes are yummy. I wil trying every Sunday. It’s taste.. Taste thank u so much..